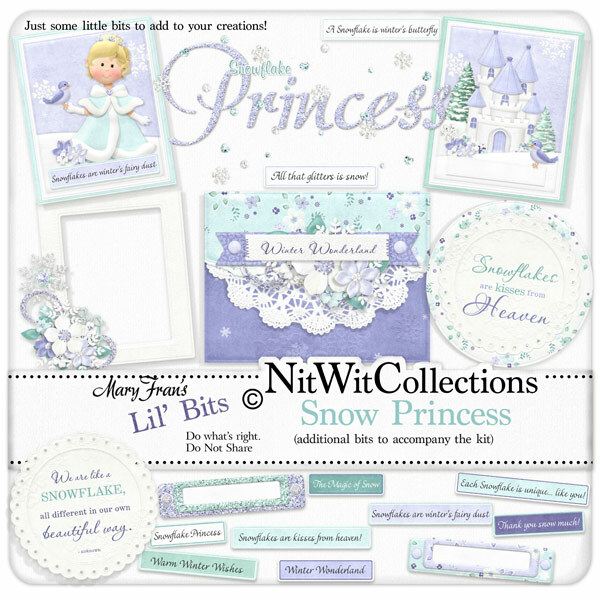 Lil' Bits "Snow Princess" will warm your heart and get your hands creating with these wonderful winter elements. These digital elements are NOT included in the FQB "Snow Princess" Collection so don't pass these by! 2 Name plates - now they don't have to be just names that go in these...dates, titles and main captions are perfectly fine as well! 1 Wordart - "We are like a Snowflake...."
1 Wordart - "Snowflakes are winter's fairy dust!" 1 Wordart - "Snowflakes are kisses from Heaven"
1 Wordart - "Snowflake Princess"
1 Wordart - "Winter Wonderland"
This product was added to our catalog on Thursday 09 January, 2014.